When you replace your roof, there are a number of things you need to consider. From the perfect color, the style of the shingles, and the material they’re made of; there’s a lot to choose from. However, there is a decision you need to consider that is much more important than all of that — attic ventilation. A home needs to breathe to thrive, and nowhere is that truer than the attic, as it can greatly impact the life of your roof. We look closer at the importance of attic ventilation here. If you are in the suburban Atlanta area and you need roofing services, call us at SAFG Inc.
Attic ventilation systems are comprised of intake at the eaves, soffits, or fascias of the roof, along with exhaust at or near the ridge of the roof. This balanced system serves two important purposes. Firstly, it allows cool, fresh air to come into the attic. Secondly, it lets hot, moist air escape the attic. While it is important to have a balanced attic ventilation system year round, it becomes absolutely vital as temperatures rise in the summer. That is because, during those months, your roof and attic will be pelted by the heat from the sun far more than during the winter. If your attic is improperly ventilated, heat and moisture can build up in the attic, which can then increase the overall temperature in your living space. An excess of heat and moisture can damage shingles, wood framing, ceilings, siding, paint, and wallpaper. With those increased temperatures, improper ventilation will also cause an increase in the amount of energy consumed by your cooling system. When an attic gets overly hot in the summer, your home’s overall temperature will be raised. Homeowners then attempt to combat that temperature change by cranking up their air conditioning and fans in hopes of keeping their living space comfortable. To fight against those higher temperatures, HVAC systems and fans will have to work harder to maintain a comfortable temperature, which causes summer cooling costs to skyrocket. This added strain on your cooling system will also reduce its lifespan, resulting in a costly replacement. 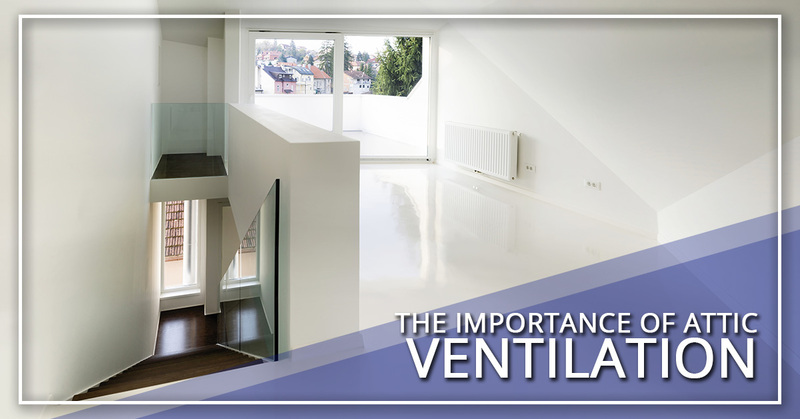 Summer is not the only time of the year where ventilation shows its importance. During the winter, everyday activities, like taking a shower, doing laundry, cooking, and running the dishwasher, can all cause extra moisture to build up and water vapor can accumulate in the attic. Without proper ventilation, that moisture is collected on the underside of your roof, where it condensates. When that happens, it gets soaked up into your home’s insulation, reducing your home’s overall energy efficiency. Excessive moisture can cause severe damage to the structure of your home, like rotting, as well as attracting wood-eating insects, like termites. It is recommended by the U.S. Federal Housing Administration that there is a minimum of at least one square foot of attic ventilation — split evenly between intake and exhaust — for every 300 square feet of attic floor space. However, it is important to note that this 1/300 rule is general and may not necessarily suit every type of building. It is instead a minimum recommended standard that should be applied when ventilating attics. With that being said, it is important not to over-ventilate your attic, as that can cause issues as well. When there are too many sources of ventilation in the roof, leaks can develop and further issues can be exacerbated by severe weather conditions. Whether you’re unsure if your attic is properly ventilated, or your heating and cooling bills have been very high in the past, it’s recommended you contact an experienced and reputable roofing contractor to inspect your roof and attic. They will be able to determine if you have the proper amount of ventilation and if there are any adjustments that can be made to improve your home’s breathability. If you’re in the suburban Atlanta area and you’re looking for a respected and reputable roofing contractor, contact SAFG Inc in Fairburn. Our expert roofing team will be able to advise you on everything from ventilation to shingle choice to ensure you get a roof you can trust. We hope to hear from you soon! FREE INSPECTION!Call Today! Or Fill Out The Form Below!